“Have a good weekend!” “Goodbye!” “Bye Brayden!” One day as we walked out of the school together, child after child told my then fourth grader, Brayden, goodbye and wished him well. He didn’t reciprocate once. I smiled and waved to the children as the children said farewell for the weekend. I later explained to him that when people say goodbye, he should say goodbye back. Huh. This was was a new revelation. He hadn’t even been paying attention to see if anyone was saying goodbye. Some social skills that seem super obvious need to be explained to a gifted child. We are all familiar with the character. The genius who can’t interact on a social level with those around them and build meaningful relationships. This type of character is very popular on television shows these days: The Big Bang Theory, Scorpion, Elementary, Dr. Who, Sherlock, Criminal Minds (and remember House and the Mentalist?) to name a few. Gifted children often need guidance on how to build and communicate in interpersonal relationships. It is stereotyped for a reason. “Competence in interpersonal relationships is probably the single most important factor in determining whether or not gifted children will be successful, caring, and contributing members of society” (A Parent’s Guide to Gifted Children, page 31). Communication has long been recognized as a key to success in business. All through college I heard, “Employers want effective communicators.” With this in mind, it isn’t surprising that communication is so high for a gifted child, also. 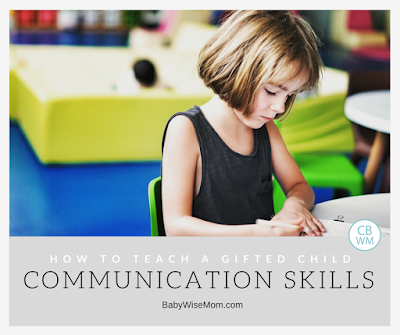 The tricky thing for parents is that often with gifted children, you literally need to teach how to communicate. It isn’t just something they pick up along the way. Things have to be pointed out and taught. The scope of the topic of communication is broad. You can major in the topic of communication (incidentally, my minor was in communication). There is a lot to learn and a lot to discuss. Let’s discus some key points. “Children learn about communication and relationships in three primary ways: first, by how parents interact with them; second, from observing parents as they interact with others; and third, from their own interactions with others” (A Parent’s Guide to Gifted Children, page 32). The common thread that binds these three things together is time. Children need to spend time with their parents to learn about communication from them. They need to spend time with their parents as they interact with others to observe those skills. They also need to spend time with peers. Put effort into spending time with your child. “Your relationship with your child is more important to her long-term future than any educational or enrichment opportunities you could provide, and it will suffer without good interpersonal communication” (A Parent’s Guide to Gifted Children, page 31-32). That means your child needs time with you more than any class or activity you could put her in. Build that relationship first–that is more important than anything else you might think your child should be doing. This also means distractions need to be removed at times so the child can learn. A child plugged in to a phone or video game will not be observing and internalizing social interactions. Over and over again, I read and hear from experts to respect and preserve the family dinner. A family dinner that is unplugged is a great way to “foster communication and build relationships” (A Parent’s Guide to Gifted Children, page 34). Listen–you can’t just talk. You have to listen. Accept feelings (even when you don’t agree with them). Create an atmosphere that promotes communication. Use reflective listening. When you do this, you basically paraphrase what the child said, but add in how your child seems to feel about it. Understand silence. Why is silence happening? Set aside special time. Give your child uninterrupted attention each day. Have days where you go on dates with your child. Share feelings. You should share your feelings just as you want your child to share her’s. Remember your own past. Talk about what your life was like when you were a child. Teach interpersonal skills. Sometimes you have to point things out. With one of my gifted children, this is a constant thing. Remember the walking out of the school story? We often need to literally teach social skills that may seem obvious. Monitor your own intense feelings. Gifted children are usually very sensitive. You can’t hide your feelings, but you can simply say you feel too strongly about a topic to discuss it at the moment. Be honest. Children can tell if your statement is a lie by your facial expressions, posture, and tone of voice. Communicate with touch. Hug, touch your child’s arm, pats on the back…touching is a great way to accentuate communication. Avoid gossip. Don’t even gossip about other children. You especially don’t want your child to hear you talking about his shortcomings to another person. Again, gifted children are sensitive and are also typically perfectionists, so you airing your grievances to other people is particularly hurtful. Those aren’t even all of the suggestions in the book. 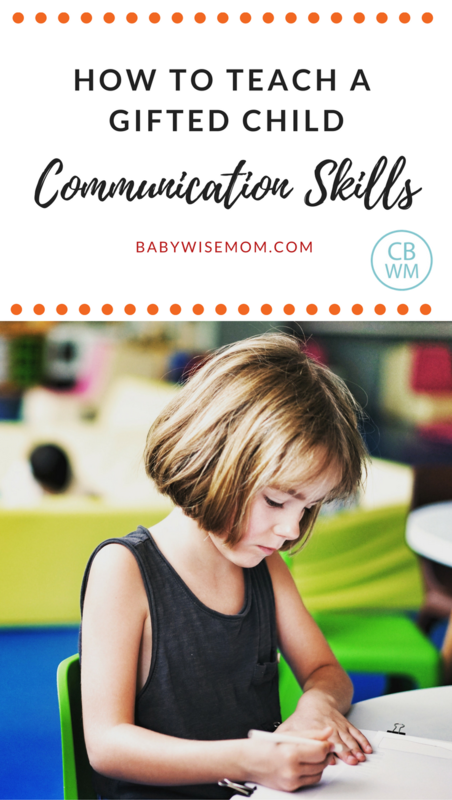 These are just some ideas to help you model good communication and help your child learn to communicate effectively. Giftedness can be lonely, and that can be minimized some by helping gifted children learn how to communicate with others. You child might simply need to be taught the obvious, like saying goodbye back when people say goodbye to them.